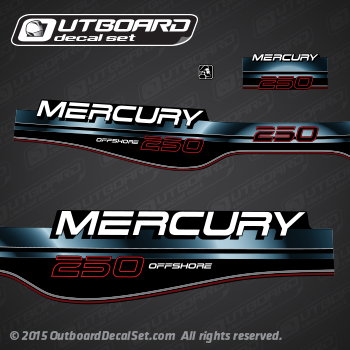 Mercury Outboard decals replica made for 1998 Mercury outboard 250 hp offshore motor based on pictures, traces and measurements. This decals may work also on 1994, 1995, 1996, 1997, 1998 and 1999 engines. with a top cowl "814277A14 TOP COWL ASSEMBLY (BLACK)"
1995 1225413RD, 1225423RD, 1225424RD, 1225433RD, 1225434RD, 7225413DD. 1996 1225413SD, 1225413ST, 1225423SD, 1225424SD, 1225433SD, 1225434SD, 7225413ED, 7225413ET, 7225423ED, 7225424ED, 7225433ED, 7225434ED. 1997 1225413TD, 1225413TS, 1225423TD, 1225424TD, 1225433TD, 1225434TD, 7225413FF, 7225413FS, 7225413FT, 7225423FD, 7225423FF, 7225424FD, 7225424FF, 7225433FD, 7225433FF, 7225434FD, 7225434FF. 1998 1225413UD, 1225423UD, 1225424UD, 1225433UD, 1225434UD, 7225413GD, 7225423GD, 7225424GD, 7225433GD, 7225434GD. 1996 1250423SD, 1250424SD, 1250433SD, 1250434SD, 7250423ED, 7250424ED, 7250433ED, 7250434ED. 1997 1250423TD, 1250424TD, 1250433TD, 1250434TD, 7250423FF, 7250424FD, 7250424FF, 7250433FD, 7250433FF, 7250434FD, 7250434FF. 1998 1250423UD, 1250424UD, 1250433UD, 1250434UD, 7250423GD, 7250424GD, 7250433GD, 7250434GD.